What a performance from Chris Dobey! The Unicorn youngster is through to the World Championship 3rd Round after a stunning 3-0 victory over Steve Beaton on Thursday at the Alexandra Palace. 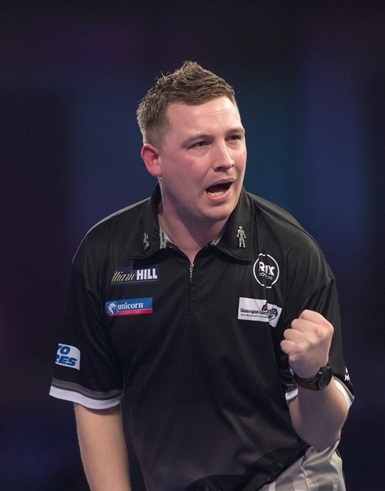 But Ted Evetts’ World Championship adventure is over as he went down to Adrian Lewis. Dobey will now face Vincent van de Voort for a place in the last 16. Beaton won just two legs as Dobey produced a blistering display. “I knew I had to start putting in a lot more work and it is paying off. I am really happy with that performance but now I have to get even better in the next round,” he said. Dobey should have won the opening set to nil but missed three darts at D16 as Beaton fought back to level. However, the Unicorn man won the set with a sublime 88 finish on the bull. After that it was one-way traffic. In fact Dobey has yet to drop a set. That’s how good he’s been! Crucial 88 and 80 finishes helped him through set two and he then chipped in with an 11 darter and a 100 check-out to seal a very impressive win. He reeled off seven straight legs with four 180s and a 94 average. Evetts lost 3-0 to Lewis but that only tells half the story. He led 2-1 in the opening set but lost it in a deciding leg. The Unicorn youngster hit six perfect darts in the first leg of the second set, only to see Lewis take it in another deciding leg with a 13 darter. And although Ted also won the first leg of set three with a 100 check out, Lewis powered to victory. Meanwhile Unicorn star Gary Anderson now knows his 3rd Round opponent on Saturday will be the quick-fire Jermaine Wattimena after the Dutchman thrashed Michael Barnard 3-0.